by Spindlove, Jeremy R.; Simonsen, Clifford E.
Jeremy Spindlove retired from his position as Director of Safety and Business Continuity Management North America for DHL Supply Chain, a global leader in supply chain management, in May 2015. He is now a principal in LLA Technologies Inc. a company that develops state-of-the-art wearable sensors and mesh networked security and life safety systems deployable in any environment. He has had firsthand experience in terrorism–through his service in the Surrey Constabulary (the United Kingdom) as one of the first police responders on the scene in 1974 when a Provisional Irish Republican Army cell detonated two bombs at pubs in Guildford, which killed six and wounded more than sixty. Jeremy went on to be recruited by British Airways as an overseas security officer to supervise air terminal security operations for the airline in Baghdad, Iraq, for two years; in Amman, Jordan, for three months; and in Beirut, Lebanon, for six months. He traveled globally throughout the network conducting airport risk assessments for British Airways plc. On his return to the UK, Jeremy set up a fraud investigation unit, tracking and intercepting illegal immigrants transiting the UK en route to North America on forged passports and travel documents mainly from Asia. He has held critical security leadership positions as Manager of Security and then Director of Airport Security at Vancouver International Airport. He is a qualified Passenger Screening Instructor and, during his airport tenure in 1994, served on the Canadian Advisory Board reviewing airport and aviation security regulations. In 1996, he moved to the Tibbett and Britten Group North America as Manager and, later, Director of Loss Prevention, Health and Safety for Western Canada and the United States, advancing to a senior position with broader responsibilities with DHL. Jeremy Spindlove is a recipient of the Royal Humane Society Award presented by Britain’s Queen Elizabeth in 1976 for his courage in saving a woman’s life. 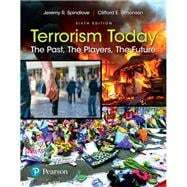 He is a long-time member of the International Society for Industrial Security and the Academy of Criminal Justice Sciences and the coauthor of the five successful previous editions of Terrorism Today: The Past, The Players, The Future. He is a frequent guest commentator on airport security and terrorism for Canada’s Global News Network. He has also authored a contributory text on victims of terrorism entitled Victimology—A Study of Crime Victims and Their Roles, edited by Judith M. Scarzi and Jack McDevitt. Clifford E. Simonsen, PhD (deceased), was formerly President of Criminology Consultants Inc. and had an extensive background and education related to the topics of terrorism, crime, and criminal behavior. His extensive education included BS, University of Nebraska-Omaha, Law Enforcement and Corrections; MS, Florida State University, Criminology and Corrections; MPA, the Ohio State University, Correctional Administration; and PhD, the Ohio State University, Administration of Criminal Justice and Deviant Behavior. Cliff retired after over 32 years as a Military Police Colonel. His extensive education in the military included the Military Police Officer Basic Course; the Military Police Officer Advanced Course; the Advanced Police Administration Course; the U.S. Army Command and General Staff College; the OR/SA Executive Course; the Industrial College of the Armed Forces; and the U.S. Army War College. Clifford Simonsen was an active member and supporter of many prestigious professional associations, including the American Correctional Association (ACA) International Committee, Washington State Correctional Association (WCA), American Society for Industrial Security (ASIS) (lifetime award), Certified Protection Professional CPP (lifetime award), The International Association of Professional Security Consultants (IAPSC), International Academy of Criminology (IAC), Academy of Criminal Justice Sciences (ACJS), and The Retired Officers Association (TROA). His honors and awards include two Meritorious Service Awards, U.S. Army; Legion of Merit, U.S. Army; Korean National Police Medal of Merit, Korean government; Outstanding Service International Association of Halfway Houses; Outstanding Achievement as a Scholar, Washington State Council on Crime and Delinquency; Fellow of the International Institute for Security and Safety Management, IISSM, New Delhi, India. He has authored Corrections in America: An Introduction, 11th Edition (2006, Prentice Hall); Juvenile Justice Today, 4th Edition (2003, Prentice Hall); and Terrorism Today: The Past, The Players, The Future, 5th Edition (2013, Prentice Hall). 15. The Future—What Next for Terrorism?